ERISLANDY LARA WINS AGAIN ON "FRIDAY NIGHT FIGHTS"
Overall Summary: Making his 4th appearance on "Friday Night Fights", Erislandy Lara defeated the veteran Darnell Boone (16-12-2, 6 KO's) by a 6 round unanimous decision to improve his record to 7-0, 4 KO's. Roll? Save money on your next judo gi. The southpaw Lara, came out blazing from the opening bell, firing straight lefts to Boone's head. In the 1st round, Boone landed a combination to Lara's body and head. Lara responded by quickly ripping shots at Boone. In the 2nd round, Lara hit Boone with straight lefts to his body. Then, Boone landed shots on the inside, but Lara responded again. Lara fired consecutive straight lefts to Boone's head, followed by a straight left to the body. In the 3rd round, Lara continued to land hard, clean left hand shots. Lara would patiently wait until Boone fired his punches and then, he would retaliate with his own combinations. By the 4th round, the edge in hand speed was apparent. Lara would throw his combinations so quickly, that Boone did not have time to counter. Again, Lara would land a left to the body. Every time Lara landed a clean punch, it would momentarily stun Boone. It looked like Boone was landing more punches in round 5, but it was most likely due to Lara's punch out put dropping a bit. In the 6th and final round, Lara staggered Boone with many punches. First, Lara landed a hard right hook to the head. Then, he landed a right hook - straight left combination to the head. Boone fell back into the ropes. Lara then landed a straight left to Boone's face and momentarily trapped him in the corner. Lara almost knocked him out, but Boone held on before the bell sounded to end the fight. Erislandy Lara was born on April 11, 1983 in Cuba. 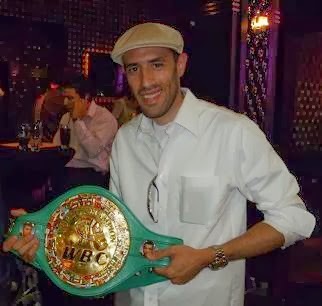 Lara has won three consecutive national amateur championships at welterweight (2005-07), and was the world champion at welterweight in 2005. Lara, who was considered to be one of the favorites at welterweight for the 2008 Beijing Olympic games, left the Cuban amateur boxing team on July 22, 2007 during the Pan-American games in Rio de Janeiro, Brazil. Lara left the team with Guillermo Rigondeaux Ortiz, and initially was reported to be turning professional with ARENA Box-Promotion and Ahmet Oener. However, Lara was subsequently arrested with Rigondeaux, and stated that he wanted to return to Cuba. Lara subsequently escaped from Cuba again via speedboat to Mexico. He has since signed with Arena Box-Promotion and turned professional in July 2008.